Whether you have an hour, an afternoon or a whole day, give your boat's chariot the pre-winter care it deserves. For boat owners in climates with a real winter season, this is a dreaded time of year — the end of boating season — and they hate it for two reasons. First, they don’t get to play with their boat for a few months; second, they know deep inside they should winterize their trailer, to protect it until next spring. Knowing and doing are two entirely different things, of course. Owners who conducted regular trailer maintenance during boating season are going to be well ahead of the game. Yeah, me either. It doesn’t have to be a painful project, and to make the task easier, we’ve divided it into time frames — call them commitment windows. Take one hour, do the absolute minimum and let it go. Take one afternoon, do a bunch of stuff and leave the remainder for next spring. Or invest an entire day, do everything and not think about the trailer for the rest of the winter. Start by thoroughly washing the trailer, to get rid of the salt and gunk from the last outing. Even if you rinse off the trailer after each use, now is the time to get serious and really get it clean. A pressure washer is your best friend. Next, protect the trailer’s tires from flat-spotting. If they sit in one spot all winter, jack up the trailer and put either jack stands or concrete blocks under the trailer frame. Don’t put the support under the springs, because you want to release their load as well. 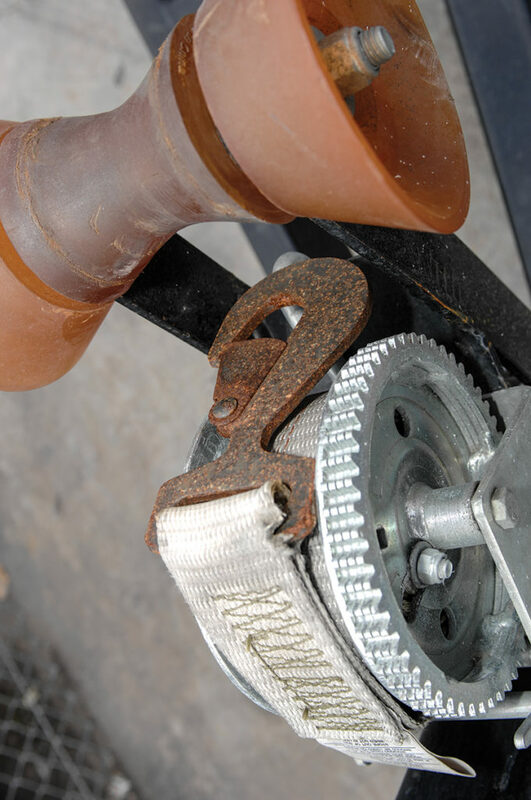 The last chore in the 60-minute quick-anddirty routine is to inspect the trailer for rust, which is typically found where you dinged it, but be sure to check all the welds, joints and U-bolts. Give any rust a quick massage with a wire brush and then hit the spot with Rust- Oleum spray (or a similar product), preferably the same color as the trailer. Sixty minutes have passed. This should suffice until spring, when you’ll have more work to do. With an afternoon to invest, do a better job of making sure the trailer is free of rust, so find every rust spot, use either a wire brush or sandpaper to take it to bare metal and follow that with a coat of protective paint/spray. 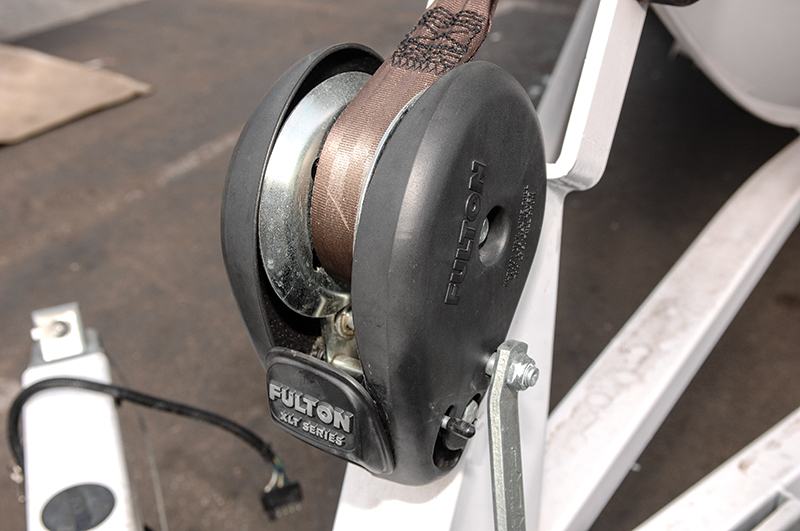 Start at the front of the trailer and give the hitch and its mechanism a good shot of lubricant such as WD-40 or Corrosion Block. Squirt the electrical plugs too, and while you’re there protect everything from winter grime with a tightly taped trash bag (buy the tough ones). Still at the front, now is the time to look at the winch and give it a shot of lubricant. Pull out the winch wire or strap — all the way! — and inspect it for fraying. If you find a “meat hook,” put the wire aside for replacement. Unless you’re parked on a really steep hill, you won’t need it until spring. Go ahead and tape a trash bag over the winch too. 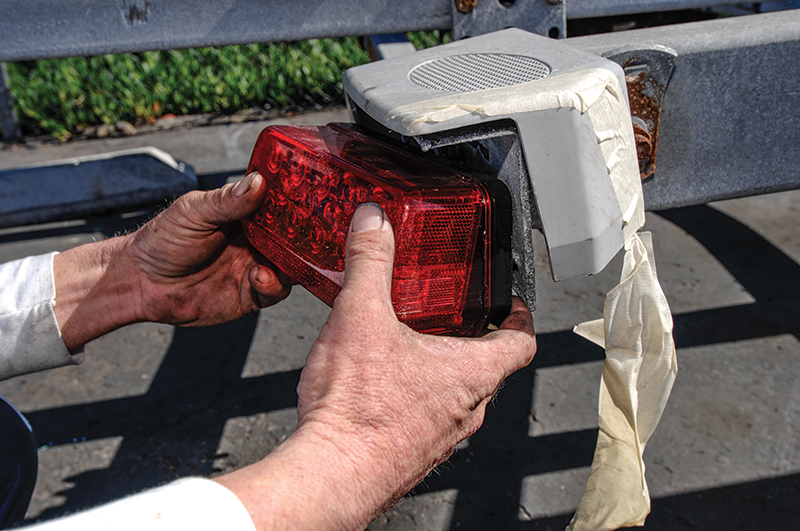 During a circumnavigation of the trailer, inspect its wiring for worn spots that could short out its tail- and signal lights. 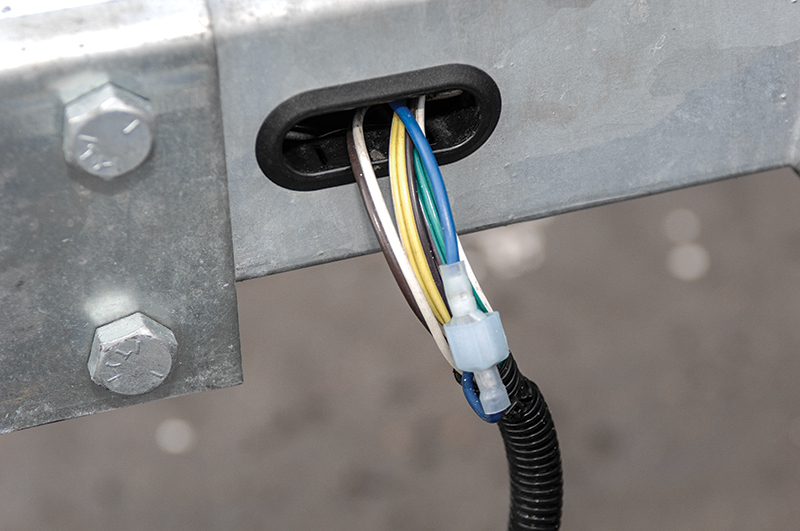 Wires usually chafe under the spring clips that hold them in place or where they pass through a grommet in the frame. It seems obvious, but replace the bad wire now, because you might forget it over the winter. With enough room in your garage or shed, you can protect the trailer’s tires from both sun and freezing water by removing them (also a good way to protect a boat from being stolen). Don’t stand the tires up, though, because that will flat-spot them. Stack them flat. Not removing the tires? Back off the lug nuts — not all at once! — and squirt some lubricant on the lug bolt threads. Pop off the taillights’ plastic covers and take a look inside. 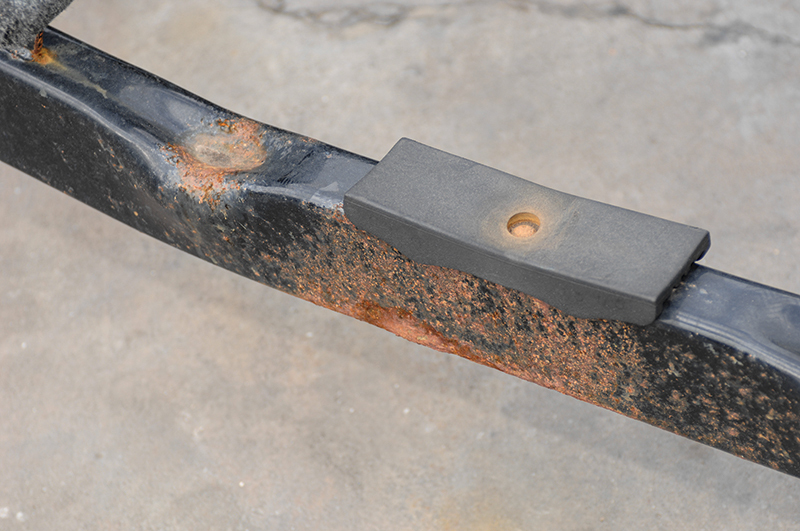 Any corrosion means a leak has formed, which requires attention. A new rubber seal for the light will likely do the trick, or you can replace the taillight for a few bucks, often by simply unplugging the old one and plugging in the new. For incandescent taillights, remove the bulb and squirt the socket with lubricant. In addition to the previously covered items, you’ll want to repack the wheel bearings or have the dealership do it. If it’s the latter, have them do it before you remove the tires, so you know the bearings are protected for the winter and the rig will be ready to roll on the first good boating day. Top off the brake fluid reservoir, just to prevent any condensation from forming over the winter. Using a grease gun, squirt lubricant into the springs and shackles for winter protection. They’ll be ready for spring, since the grease will remain for months. Last, if the rims are getting rusty, take the wheels to a local tire store and let its people remove the tires. You can now repaint the rims at your leisure over the winter and have the tires reinstalled later. One final word of advice (which I usually forget): Assemble all the necessary tools and parts beforehand. You don’t want to waste the hour, afternoon, or day going to Home Depot to buy rust protectant or chase down a spray can of lubricant.